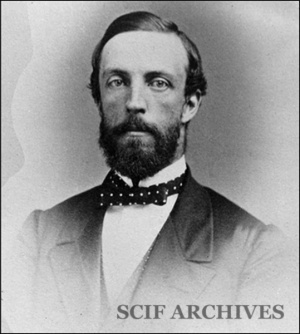 COOPER, James Graham (1830-1902), New York-born physician, ornithologist, field naturalist, and conchologist associated with the California Academy of Sciences. He graduated from the College of Physicians and Surgeons in 1851, spending the two years following in New York hospitals. Cooper served as one of the physicians of the Pacific Railroad Survey Expedition for two years. Cooper is known to have visited several of the California Channel Islands: as early as October 1861 he visited Santa Catalina Island; in mid-May, 1862 he visited Santa Cruz Island; and in 1863 he visited Santa Barbara, Santa Catalina, San Nicolas and San Clemente islands. Cooper camped on Santa Barbara Island May 24-June 12, 1863 with a party engaged in hunting sea lions, and made the first known botanical collection from that island. January 9, 1866 Cooper married Rosanna McPherson Wells (1843- ), a San Francisco clergyman's daughter. In 1871 Cooper settled in Ventura County, where he remained until 1875. He then moved to Hayward, California where he remained until his death on July 19, 1902. Cooper published may articles on conchology, botany, ornithology, mammalogy, geology, and paleontology. Spencer F. Baird characterized Cooper's work as: “By far the most valuable contribution to the biography of American birds that has appeared since the time of Audubon.” The authoritative chapter on zoology in T. F. Cronise's Natural Wealth of California (1868) is by Cooper. Specimens he collected are in the Museum of Vertebrate Zoology, Harvard and the U.S. National Museum of Natural History. Lorenzo Yates modeled his 1890 Mollusca of Santa Barbara County after the work of Cooper. Cooper's hawk is named in his honor. James G. Cooper died at age 72 at his home in Hayward, Alameda County, California on July 19, 1902. » Coan, E. James Graham Cooper, Pioneer West Coast Naturalist The Northwest Naturalist Book, The University Press of Idaho, Moscow, Idaho 1981. This page was last edited on 31 March 2019, at 10:15.